San Francisco and Osaka, Japan have enjoyed a sister city relationship since 1957. To commemorate the 40th anniversary of this arrangement - one of the oldest sister city relationships in the world - a special conference was presented in Osaka in May, 1997. A diverse delegation of more than 100 citizen ambassadors from San Francisco attended the conference, comprised of representatives from business, education, arts and community organizing. The group included former San Francisco Mayor George Christopher, San Francisco State University President Robert A. Corrigan, artist Keith Morrison, Omega Boys Club Director (and MacArthur fellow) Joe Marshall, members of the rockin' New Jazz Collective, MUNI Director Emilio Cruz and City Supervisors Amos Brown, Leslie Katz, Jose Medina and Mabel Teng. I attended as a representative of the San Francisco Bicycle Coalition (SFBC). Most of the San Francisco delegation stayed at either the Miyako Hotel or the International House, close to the conference site. I was fortunate to be among 12 delegates who signed up for a "homestay" arranged by the conference organizers. Most of the homestay group were placed with older "empty-nest" couples or families. My host was Mami Nishide, a woman in her early 40s who had lived in London for four years and spoke perfect English. Mami lives in Takaishi City, roughly 30 miles south of Osaka, so I was required to learn the train system real quick. This was only one of the benefits of the homestay, which really was the best way to learn about Japan and its culture. Everyone seems to have a bicycle, which are present everywhere in the city. 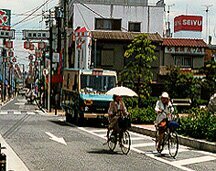 Osaka is flat and enjoys a temperate climate, which greatly facilitates the use of bicycles. The bikes I saw are generally cheaper and less complicated than bicycles seen in the US. Practicality prevails over performance. 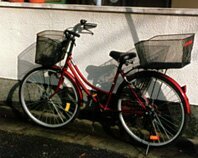 Bikes in Osaka typically are one-speed models with high-tensile steel frames, fenders, a kickstand, generator lights, a caliper front brake and a disk rear brake, and a steel-mesh basket attached to the handlebars. You rarely see the diamond-frame so popular in the US; the top tube is welded to the seat tube a few inches above the bottom bracket - what would be called a "women's" or "step through" bike here. When they ride their "charis", they go at a pace not much faster than walking. You rarely see anyone riding fast, and no one wears a helmet. Many older streets are very narrow, perhaps just 20 feet wide. On such streets there is no true sidewalk, nor is there a designated bike lane. Pedestrians, cyclists and motorists share the street, with no apparent heirarchy. There are frequent accidents and injuries resulting from collisions with automobiles, though the accident rate pro-rated over the distance traveled is not as high as in the US . While everyone in Osaka rides a bicycle, they generally don't travel too far. They may ride a couple miles to run errands or to shop. (I was impressed by the "LIFE" supermarket in Takaishi City, which provides no parking for cars, but has a sizeable area filled with "mama-charis.") However, most people I spoke with were surprised when I told them of my daily 11 km (7 miles) commute each way to work. A typical commuter in the Osaka Prefecture rides their bike - if they don't walk - a mile or less to the nearest train station, where they take advantage of the region's excellent transit system. Bikes are not allowed on board the trains, which are often crowded to capacity. Most stations in the suburbs have multiple-story bike parking garages or lots nearby, which charge a modest daily fee. 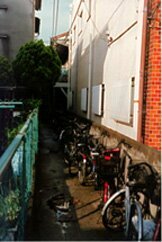 The station at Takaishi City, where I stayed during the conference, charged 100 yen (about 90 cents) to park your bike. I was told that many commuters have a second bike at their destination station to complete their trip. In downtown Osaka, nearly every underground train or subway station has hundreds of bikes parked on the sidewalk outside. This often creates problems for pedestrians and handicapped people trying to get past. Some areas have monitors - who are often retired workers - who arrange and tighten up the parked bikes and keep the sidewalk clear. In other areas police officers attach warnings to parked bicycles that are creating a hazard. I was informed that bikes are occasionally seized by police if they create a significant problem, though the miscreants rarely bother to claim their rusty and cheap "charis". Because bicycles are so cheap and ubiquitous, security doesn't seem to be a major concern. (Japan has a lower crime rate than the US in general.) Many bikes aren't locked at all. Those that are secured are locked with a thin cable or chain. Some bikes have a lock on the fork or frame that inserts a metal bar into the spokes, preventing movement. Some high-end bikes have a heavier chain. I never saw the U-lock so prevalent in the US. A major motivation for the broad use of bicycles is economic. Cars are expensive to own and operate in Japan. Gas is not as cheap as in the US. Many highways are expensive toll roads; the road connecting the Kansai Airport, situated on a man-made island, to the mainland charges a toll of $12. In densely populated urban areas like Osaka there is no on-street parking; private lots command several hundred dollars a month per space. Despite the high-cost, car ownership continues to grow in Japan. Nearly five million people drive everyday in the Osaka Perfecture, a 400 percent increase since 1960. A visit to Osaka is very refreshing for a US bike activist. In the US cycling is viewed much like acne: as something you experience when you're young, which you will eventually outgrow. "Be mature and buy a car," we're told. Imagine observing hundreds of mature, well-dressed men and women riding a chari to work or shopping. What an inspiring argument for the propriety, rationality and sensibility of cycling.